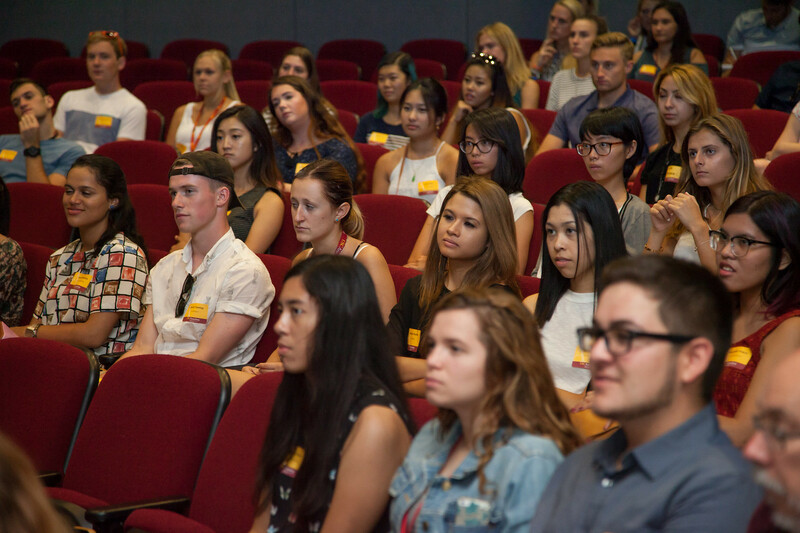 USC Annenberg School for Communication and Journalism Dean Ernest J. Wilson III speaks to a host of first year students about the Third Space on August 18, 2016, during the New Student Assembly. Updated Sep. 5, 2017 3:43 p.m.
After this tone-setting introduction, a dozen faculty from both the School of Communication and the School of Journalism were given a few minutes each to pitch their classes, centers, and their research to the students. Banet-Weiser encouraged the students to not be afraid to talk to their professors, and to take advantage of all the resources that Annenberg has to offer. “If there’s something you don’t know, come and talk to us,” she told the crowd. Bay offered similar advice through in a non-traditional format. Using a series of Snapchat-style videos, she encouraged the students to come to the Annenberg Media Center, learn how to use the available tools, and to attend events at Wallis Annenberg Hall. She emphasized that at Annenberg, “journalism and content is produced across all platforms and all media,” and that students have all the resources at their fingertips to become producers themselves.